Dolly Parton is an extremely inspirational artist and therefore it comes as no surprise that she has proved the inspiration behind many different works of art. Her 1973 hit single ‘Jolene’ has proved the inspiration for loads of covers and at least 5 answer songs which are listed below. We also discuss whether Dolly is really being fair to Jolene in this week’s episode of JimBob’s Music Massacre. Kirsty Maccoll’s 1994 single “Caroline” is an in-spirit response song to “Jolene,” in which the Jolene character grieves the loss of her best friend (the titular Caroline) after having an affair with Caroline’s husband. In 2011, Estonian indie rock band Ewert and the Two Dragons released an answer song, also titled “Jolene,” in response to the original recording. 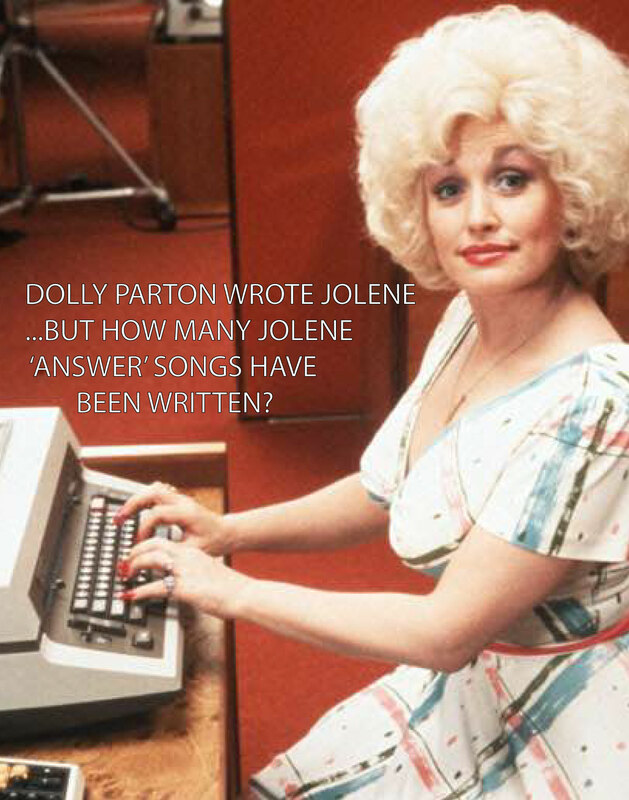 In this version, Parton’s “man” directly addresses Jolene, telling her that nothing will ever happen between them and that his current lover would fight to get him back. In 2013, country singer Jennifer Nettles recorded “That Girl,” which she stated in interviews should be subtitled “The Ballad of Jolene.” The song is written from the perspective of the Jolene character, who Nettle feels is unfairly maligned in the original song. In this version, the other woman is shown to have no interest in taking another woman’s man, and her song is in fact framed as a warning to Parton’s character that “her man” has a roving eye. The concept of Dolly Parton suffering from paranoia regarding Jolene was also discussed in S01 E03 of musical comedy podcast JimBob’s Music Massacre in February 2018. In 2013, The Beautiful South guitarist David Rotheray recorded an album of answer songs, among which is “Jolene’s Song,” performed by Julie Murphy. This version of Jolene is equally heartbroken to learn that the man who loves her belongs to another woman and expresses her pain at being painted as a heartless temptress by the original song.